On November 3rd 1957 the Soviet Union launched Sputnik 2 into Space. On board the satellite was the first Earthling to go into orbit. (SLV). She most likely wasn't the first living Earthling in orbit. "The more time passes, the more I'm sorry about it. We shouldn't have done it ... We did not learn enough from this mission to justify the death of the dog." What do you mean? I tried googling this but don't really understand the implication. Laika wasn't alive? Laika didn't go to orbit? Something else was first? I think that farlukar means that there were likely some microbes that were taken up to space by previous rockets. There are stories I can’t take. 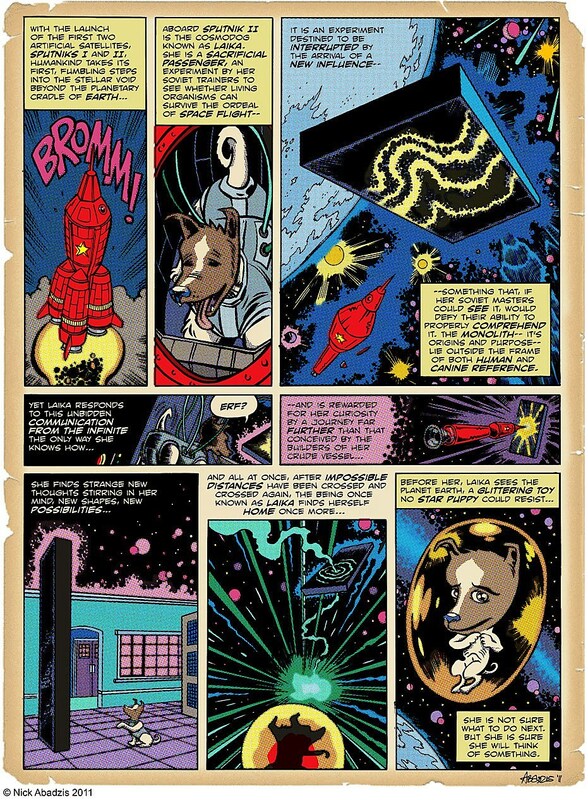 The graphic novel Laika is really good, e.g. And, obligatory Achewood, "If you think about it even medium hard, launching a scared little dog into space with no intention of getting it back is a seriously fucked up thing to do." Also, the first organisms deliberately fired into space were some fruit flies. The second was a cob of corn. There are so many humans who have done despicable, cruel things and yet I would never, never advocate sending any of them into space to die alone and afraid in the name of science. So the thought that we (I mean, we as a species) did this to, as someone said above, a scared little dog...I can hardly bear it. What is wrong with us?